Plan for the day: Magic Kingdom in the morning, then off to Hollywood Studios and then to Epcot again! We thought about doing the 4 parks in 1 day thing again, but instead we want to spend a little longer in each park. Our trip is already almost half over!!! Today we will be meeting Shante at Magic Kingdom. She is doing her College Program. We’ve known her since she was a tiny toddler. We are excited to see her and hear all about her Disney adventures. I can! This adorable little boy was sitting across from us on the bus, he struck up a conversation with my daughter and talked the whole way. He was sooo cute! He was telling her all about the toys he left at home, what rides he had ridden, etc. He was precious! Made the ride seem shorter. She is the child whisperer – seriously. Little kids are drawn to her! She works with special needs kids, and is such a wonderful person. She has a heart for children, and this job is really perfect for her! She is making a difference! And even these random kids at Disney World see that in her, and they want to know her! The security line at Magic Kingdom was pretty long, but it went quick. I found a line without any strollers or groups of people with large backpacks – that’s the ticket! By the time we got through security, and into the park, it was 9:10. Park opened at 9, so that’s not too bad! I wanted to get more Sorcerer of Magic Kingdom cards but the line was long, so we just kept walking. There was a cute little singing / dancing group performing at the end of Main Street, we stopped and watched them. Took lots of Main Street and Castle pictures, searched for baby ducks, and then went on through the castle and into Fantasyland. We made a wish at the wishing fountain, and I have to say that my wish came true! I dont think I can tell you what it was, but just know that it did come true! My daughter wanted some pixie dust, so we went into the little shop and she asked one of the Fairy Godmothers for some. She was not a particularly sweet Fairy Godmother, maybe she woke up on the wrong side of the bed. She did do the pixie dust and then rushed away. Sorry we bugged her, but that’s her job. Haha My sparkly daughter and I went over to Peter Pan and Its a Small World to take some photos. Those were the attractions my daughter worked at during her College Program and she definitely has a place in her heard for those rides! Now it was time for Shante to meet us. We had 10:05 reservation for Be Our Guest. But where is Shante? She texts us to tell her that they are on the bus, they have not gotten to the park yet. We went over and asked how long they could hold our reservation – the girl said for 30 minutes. So we waited on a nice shady rock for Shante and her friend Izzy to show up. We waited, and waited, and waited and finally time was up! 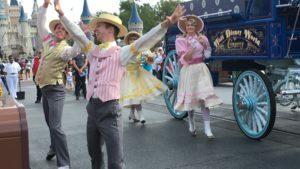 They still were not in the park – so my daughter and I went in and ate, and told them we would find them when we were done. We both ordered the Feast A la Gaston. It was the most normal breakfasty meal. Bacon, Sausage, Eggs, Potatoes & Fruit – oh and a tray of pastries for us to share. It was actually pretty good. Was it worth $24 – no, but we enjoyed our meal. Its so pretty inside the restaurant. We ate in the ballroom and it was gorgeous! After we ate we went into the other rooms to take photos and check them out. I’m glad we did this meal. After breakfast we went over to meet Shante and Izzy over at Gaston’s Tavern. It was so great seeing Shante, catching up and just loved hanging out with her! We only had until about 2:15 with her and then we had to head over to Hollywood Studios for our Fast Passes over there. 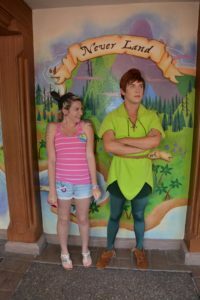 While with Shante and Izzy we went to meet Peter Pan! Peter Pan is one of my daughters favorite characters. She was soooo excited to meet him! She has met him before, but he is the kind of guy you want to see more than once! We waited about 15 minutes to see him. Then we headed over to the Haunted Mansion. The line was too long. So instead we went to the Pirate Adventure little buidling. I heard they had a little game you could play and once you complete it they give you a fast pass for Pirates. We played the game – it was a lot like the Sorcerers of Magic Kingdom game – but pirate themed. We did not get a fast pass, but we had fun and got a souvenir map. The line for pirates was 50 minutes long, so we kept on walking. I know what doesn’t have a long line .. like ever .. The People mover! Its nice and relaxing & cool, too. So off we went. We took a bunch of photos along the way, of course. Chatted a bunch and enjoyed our time with Shante. We found a nice shady spot to sit, have a cool drink and chat some more! Before we knew it, it was time for us to leave. Shante looks great and is having a wonderful time working at Disney World! It made my heart happy to see her looking so good, and hearing that she was enjoying herself! 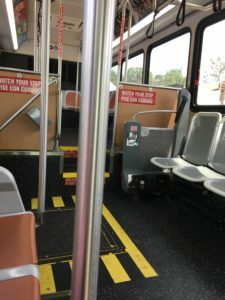 We hopped on the Express Transportation Bus to Hollywood Studios. Once again, we are the only ones on the bus. We got to the check in spot just as the bus arrived – so no wait at all. The bus left exactly when it was suppose to. It was nice and cool in the bus, which felt good. The heat and humidity really takes a lot out of you! The humidity was really building up today. Tomorrow they are expecting a big storm! We had plans to do the Segway Tour tomorrow, but with the rain coming – I cancelled it. We have done it before, so not a huge loss!! We had Fast Passes for both Rock N Roller Coaster and for Tower of Terror. We also had one for Star Tours but we didnt want to walk all the way over there to ride it – we have it at Disneyland. So we let that one expire. Rode Rock N Roller Coaster first. I just cant get enough of that ride. It is so much fun! As we walked out we noticed everyone hanging out near the exit, hiding from the rain. I didn’t know it was going to rain, but it is! Just sprinkling, actually. We are not afraid of a couple sprinkles – so we head over to Tower of Terror. I just love the Tower of Terror! We have a Fast Pass but its not quite time yet. The standby line is only 10 minutes, so we decided to ride it and then hop back on afterwards for our Fast Pass. The raindrops must be scaring everyone away – the line was pretty short! We miss Tower of Terror so much. The one in Disney’s California Adventure is being changed over to a new theme – Guardians of the Galaxy. 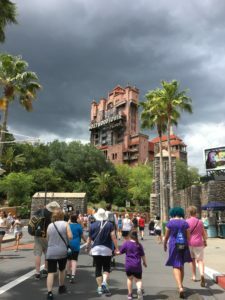 It might be cool, but Tower of Terror is what it should stay! Anyway we got in line .. and as we are standing there buckets of rain start falling from the sky! We were getting soaked! I had ponchos in my bag, so we pulled them out and put them on. We were still wet, but not as wet as others in line with us! Once we got safely out of the downpour, we opened up the line queue under the building overhang to help the rest of the people get in out of the rain. We probably were not suppose to do that, but oh well! Look at this picture of the wet group. This was taken as we got into the building out of the downpour. 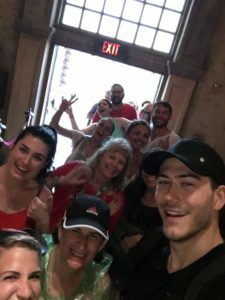 We had super fun people in line with us, and it really helped! We got on the ride pretty quick once we were in the building. We could hear all the thunder outside and we were glad we were not out in it any longer. As soon as we exited the ride, it started to clear up a bit. We ran to the restroom and then got into the Fast Pass line to ride again. This was a much quicker line and there was no more rain, so it was nice! This is such a fun ride. I really miss it. I have high hopes for the Guardians of the Galaxy ride at DIsneyland! It iopens on May 27th. We will have to go check it out. 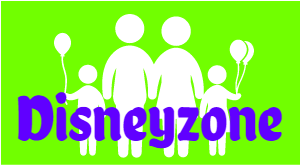 We have Disneyland annual passes so we’ll probably go a few times in the coming months. It wasn’t quite time for our dinner reservations, so we did some more people watching. We only had about 10 minutes to go, so we just checked in early. We ate at Prime Time 50s Restaurant. I think this place is fun. I know some people hate it. Its definitely not for self-conscious people or people who have no sense of humor – to me, its fun! The decor is 50s – and it feels like my grandma’s house use to feel. All the turquoise and pastel colors. Even the calendars on the walls were made to look authentic. We shared the fried chicken dinner and we ordered some onion rings. It was actually really good. We ate it all! Then, since we are celebrating my daughters birthday during our trip, she got a dessert. It was a yummy sundae! She loved it. From here we take the Express bus to Epcot. Our plan was to do more of the countries and then stay to see Illuminations, then go have a late dessert at Beaches and Cream. We are eating so much junk!!! But we are also walking a ton, so its a trade off. Quick drive to Epcot. One other group on the bus. Took a bunch more photos, and my daughter called her boyfriend. 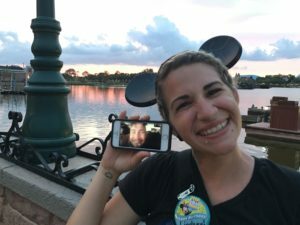 They facetimed – she took him on a tour of the World Showcase via Facetime! It was hilarious. I think he enjoyed it. You could hear him saying ‘Coming through’ ‘excuse me’ ‘nice hat!’ etc to the guests as we walked through the crowds. It was hilarious! Now he can say he was at Epcot! We stopped and got some lemoncello margaritas in Italy. Then found a nice comfy bench and sat and waited for Illuminations. We could hear the Berlin concert as we sat. They were playing in the American Pavilion. I only recognized a few songs. I was a big fan back in the 80s. Illuminations is not my favorite show. Its boring for a portion of it while the big glowing globe goes by, the fireworks are fun. It just doesn’t do anything for me. I know people love it. From there we left out the International Gateway Entrance and walked over to the Beach Club. Ahhh.. The Beach Club. That’s my favorite resort. We have stayed there many times! I also love the Yacht Club. 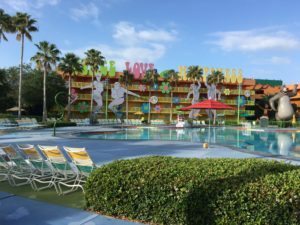 I not only love the resort and the amazing pool area itself, I love the location! Its just so easy to walk over to Epcot, to Hollywood Studios, to the Boardwalk.. Take a boat ride, watch fireworks from the beach, etc.. So anyway, we wandered over to the Beach Club. We sat on the swings and watched the Hollywood Studios firework show, enjoyed the sand and the views and the cooler air. It was so nice and relaxing. Our reservation for Beaches & Cream was at 10pm. We went and checked in about 5 minutes early, waited outside by the gorgeous pool area for maybe 2 minutes and then we were called in. There were several empty tables, so I guess people made reservations and then flaked. Sad because that’s a hard reservation to get! All of a sudden I didn’t feel so hot – nothing terrible, just didn’t want to eat, felt like I needed fresh air. I went outside for a bit, then came back and nibbled on the salad I ordered. I think I was just over tired, hot, and just needed some sleep! I am not a drinker either, and we did have that margarita earlier! I had one for myself, instead of us sharing. I’m a lightweight! 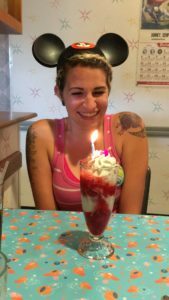 So anyway.. back to Beaches & Cream – My daughter got a hot fudge sundae, which she loved, and then we were on our way back to our hotel. I dont know how she can eat so much ice cream and not get a stomach ache. I get one just looking at all that creamy goodness! 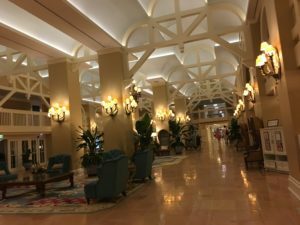 Beach Club lobby – I love this resort. If money was no object, I would stay at the Yacht and Beach Club every trip! 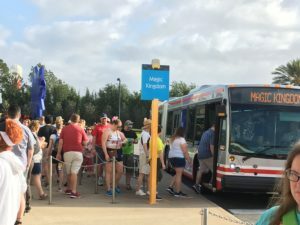 It was going to be a long bus ride back – we would have to take a bus to Disney Springs (only thing still open) and then transfer to a Pop Century bus — instead, I used my Lyft app (where I had a $5 coupon) to get a ride for us. We met him in front of the Beach Club. Took him maybe 2 minutes to arrive. He drove us back to Pop Century. Cost me a whopping $1.20. I gave him a $3 tip. I only had 3 singles and then a 20, so he got the $3. I dont think a lot of people tip – these drivers sure seemed appreciative! Saved us a bunch of time! Definitely a great call on my part. We got to the room and I passed out! 19,661 steps.